View More In Rock Salt. 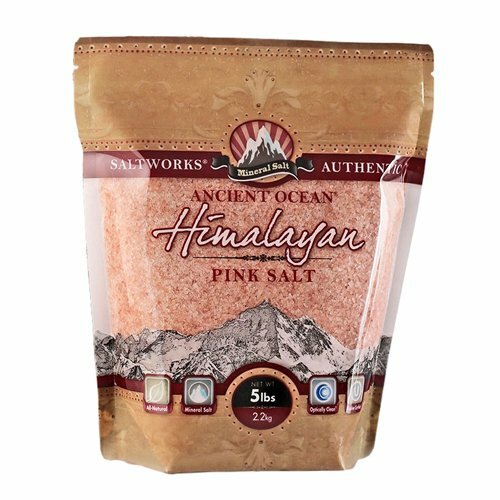 Harvested from ancient sea salt deposits that lie deep beneath the Himalayas, our Ancient Ocean Himalayan Pink Salt by SaltWorks is one of the best mineral salts available. Protected from the ages by the breathtaking mountains in Pakistan, the crystalized sea salt that was once a prehistoric ocean is now a pure, mineral-rich salt that has garnered more than a cult following. Treasured for its clean, upfront salt taste and its extraordinary color, all-natural Himalayan Pink Salt has become an important ingredient in kitchens worldwide. The varying shades of delicate pink to dark rose are the lasting result of trace minerals such as iron, magnesium, potassium and calcium. We ensure that SaltWorks? Himalayan Pink Salt is only of the highest quality, is completely organic compliant and is certified kosher by the Orthodox Union. Buy in bulk to replace your everyday table salt with delicious Himalayan Pink Salt. Fine Grain: Fine grain Himalayan Pink Salt is the perfect size for your tableside salt shaker, for use in cooking, grilling, roasting-even as a lovely pink salt rim on a cocktail. If you have any questions about this product by SaltWorks, contact us by completing and submitting the form below. If you are looking for a specif part number, please include it with your message.